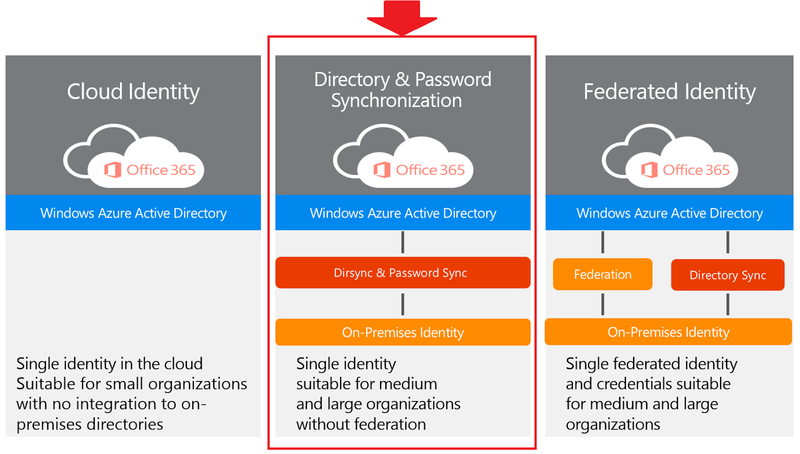 By deploying password sync in your environment, you enable your users to use the same password they are using to logon to your on-premises Active Directory to logon to Windows Azure Active Directory. The latest version of the Directory Sync tool (version 1.0.6385.0012) can be downloaded from the Office 365, InTune and Azure UX Portals. Password Sync is a feature of the Windows Azure Active Directory Sync tool that synchronizes user passwords from your on-premises Active Directory to Windows Azure Active Directory (“Azure AD”). This feature enables your users to log into their Azure Active Directory services (such as Office 365, InTune, CRM Online, etc.) using the same password as they use to log into your on-premises network. It is important to note that this feature does not provide a Single Sign-On (SSO) solution because there is no token sharing / exchange in the Password Sync based process. 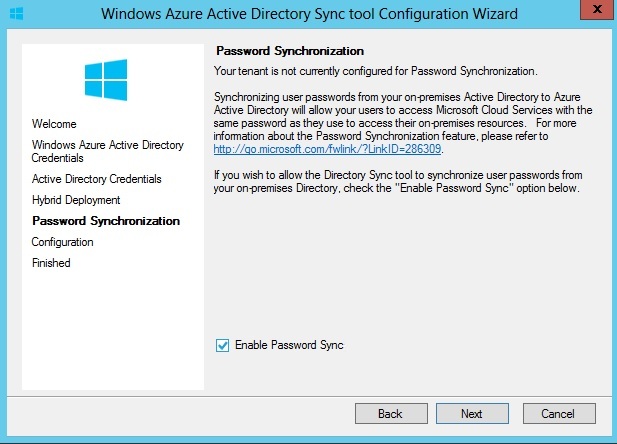 Password Sync is an extension to the directory synchronization feature implemented by the Directory Sync tool. As a consequence of this, this feature requires directory synchronization between your on-premise and your Windows Azure Active Directory to be configured. Passwords are synchronized more frequently than the standard Directory Sync window for other attributes. Passwords are synchronized on a per-user basis and are generally synchronized in chronological order. When a user’s password is synchronized from the on-premises AD to the cloud, the existing cloud password will be overwritten. The installation process is completely automatic. You do not any more have to read through the complex and confusing manuals and instruction sheets about installing the software. Even a highly complex software can be installed with just a click.